I much prefer jam to jellies. Those chunks of fruit make me feel like it is healthy for me to scoop out mountains of the goo on top my toast. As for the making of, jam takes so little effort and is incredibly forgiving (if it's runny, no problem) unlike jelly (if it's runny, it's now ice cream syrup). Saying that, other people seem to prefer jellies. So I make them, to make my friends and family happy...plus that's how I use my peels and pits from the fruit I use for jam - nothing is wasted. I found a bag of apple peels and cores in the deep freeze from some applesauce that I had canned and thought I would go ahead and take care of them while I was in canning mode. Your ratio is one box (1 3/4oz.) of pectin & 9c. sugar to 7c. juice. In a stainless steel pot, bring the peels and water up to a simmer for about 30 minutes. Strain the juice and rinse out the pot. Measure out 7 cups of juice, pour into the pot, and whisk in the pectin. Bring to a boil. Have your sugar ready to go once it hits boiling point so that you can dump it all in at once. Throw in the sugar and bring to a boil. Boil hard for 4 minutes. Ladle into clean jars and process in a water bath for 5 minutes. The cinnamon sticks and vanilla pod can be left out to dry on a paper towel. Once dry, throw them in a jar with white sugar and place in a dark cabinet. Every once in a while shake the jar. In a couple of months you will have sugar that is scented with cinnamon and sugar to be used in coffee or on top of shortbread. Love the cinnamon sugar idea! Will have to try that! 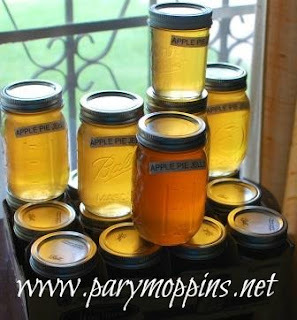 Apple Pie Jelly, this Jelly looks awesome! Thank you so much for sharing with Full Plate Thursday and have a great week. I bet your house smelt AMAZING when you were making those!